We believe in 100% Guaranteed . It represents both our philosophy of sharing the best of times with our loyal customers and our promise to deliver a premium anker to you, your family and your friends. We pride ourselves on customer service and will do whatever it takes to make you happy. HERE'S HOW WE'RE DIFFERENT - Our galvanized anchor is resistant to rust, and the anchor line is a full 40 feet long. Longer rope allows for better horizontal drag and a stronger hold. 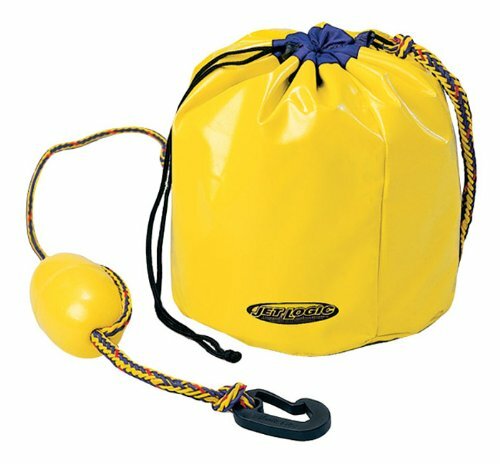 Also includes a nylon storage bag, a buoy ball and a stainless steel carabiner. 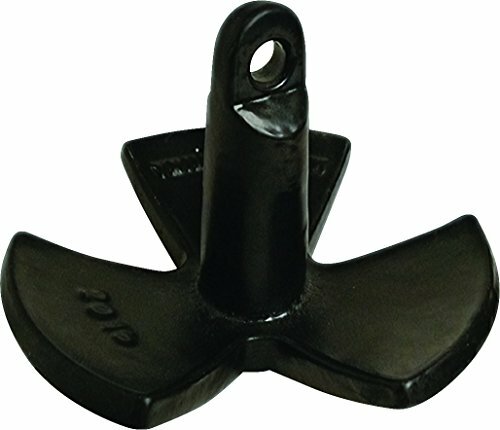 IDEAL SIZE - Unlike mushroom anchors, our small boat anchor is only 12 inches x 3 inches when closed. It weighs 3.5 pounds, takes up minimal space and can easily be stored in kayaks, canoes, dinghy, SUP paddle boards or Seadoo waverunner PWC. Perfect small boat & kayak accessories. KAYAK FISHING - Our folding anchor was launched with the kayak fisherman in mind. Its compact size is easy to store, keeping it out of the way of your kayak fishing gear. Its 4 fluke grapple design is ideal for sandy, weedy or rocky bottoms. Learn how to rock rig your anchor! HOW IT WORKS - Simply slide the grappling anchor collar upwards, fold open the 4 flukes, slide the collar back down, and lock into position. Use as much anchor rope as possible to create better horizontal drag on the bottom surface of ponds, rivers, lakes or oceans. RISK FREE PURCHASE - We're proudly owned and operated out of Boston, MA! If you're not satisfied with your anchor, you're protected by a 1 year, no-questions asked, money back guarantee. We take pride in our products and our customer service is second to none. Anchor measures 21.5 tall and 15 wide. CONVENIENCE - The anchor folds into a 12" x 3" size and slips into a fully padded storage bag that will prevent scratches to your board, kayak, or Jet Ski. FUNCTIONAL: The anchor is easy to use, storage friendly, and ideal for environments of any kind. Whether it's sandy, weedy, muddy, or rocky our anchor will hold. 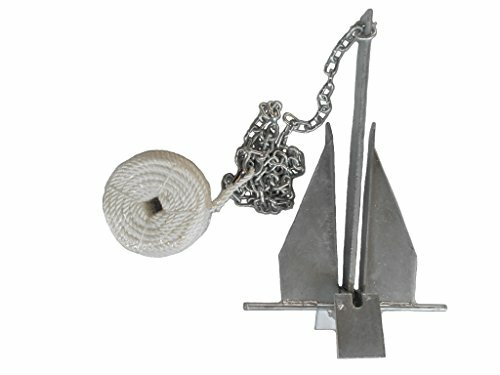 MARINE GRADE- The anchor is rust resistant with 25 feet of green/black marine grade rope (7mm thick). It also includes a PVC flotation buoy and stainless steel snap hook for quick and easy connections. Our Marine Folding Anchor is a sleek green that allows for easy visualization. It is manufactured to be rust-resistant and includes 25 feet of Marine Grade, a floatation buoy, a stainless steel snap hook, and a padded storage bag. See for yourself why outdoor enthusiasts are raving about the Gradient Marine Folding Anchor. Gradient Fitness is a Physical Therapist owned company and operated out of Rochester, NY. We love being outdoors. That's why we create innovative products designed for ultimate functionality to maximize convenience and fun. 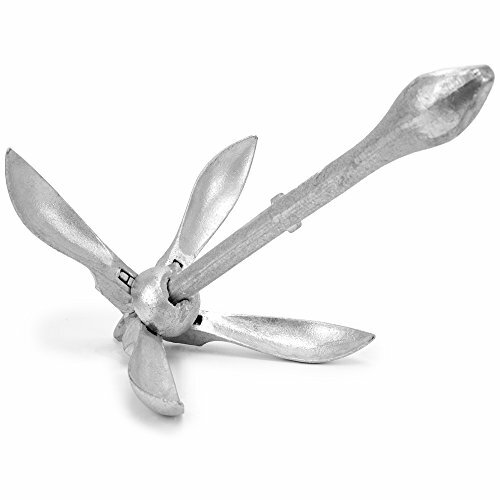 FOLDING ANCHOR: Our 3.5 lb 4-fluke folding anchor is compact and convenient. Included is a padded draw string storage bag that is perfect for the outdoor person on-the-go. CONVENIENCE: The anchor folds into a 12 x 3 size and slips into a fully padded storage bag that will prevent scratches to your board, kayak, or Jet Ski. 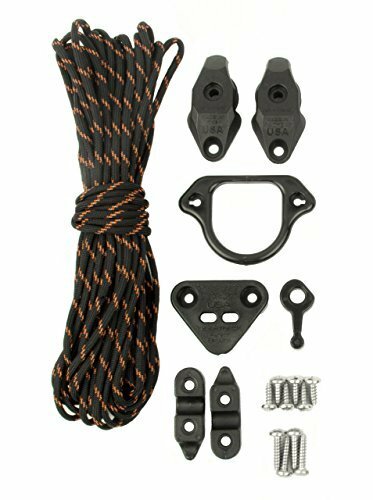 MARINE GRADE: The anchor is rust resistant with 25 feet of green/black marine grade rope (7mm thick). It also includes a PVC flotation buoy and stainless steel snap hook for quick and easy connections. DESIGNED FOR THE OUTDOORS: From SUP Yoga to fishing from a kayak we've got you covered. The anchor is easy to use, storage friendly, and ideal for environments of any kind. Whether it's sandy, weedy, muddy, or rocky our anchor will hold. Get hooked with these grapnel boat anchors by Crown Sporting Goods. Made from galvanized steel, these anchors can withstand extreme weather conditions without breaking or corroding. 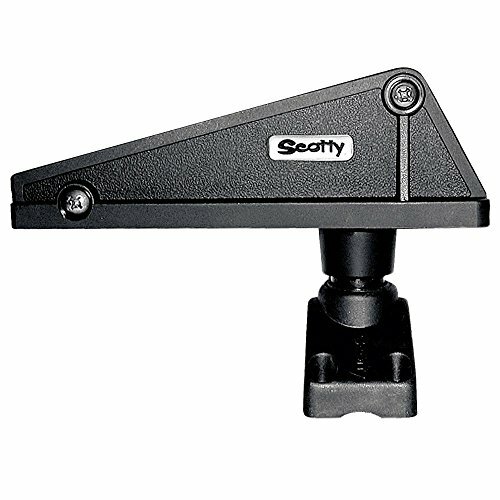 The prongs lock into place with a simple twist and easily fold for compact storage. 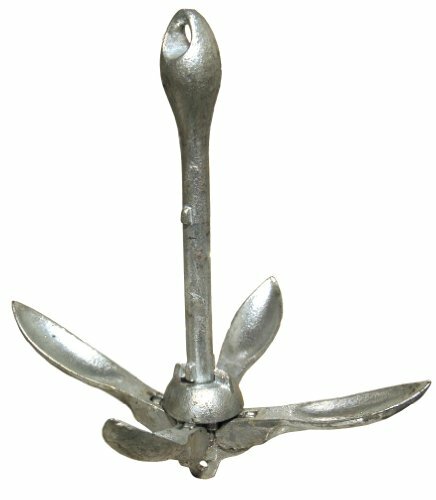 Grapnel anchors are designed for short-term, inland use for areas with low current. They are great for small boats like kayaks, canoes, inflatables, and dinghies. Their four-prong structure is perfect to secure your boat in heavy weeds, coral, stone, and gravel. Available in 7 different weights, you're sure to find the right size for you: 1.5lbs, 3lbs, 5.5lbs, 7lbs, 9lbs, 13lbs, and 17.5lbs. 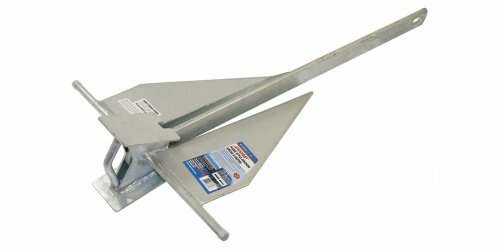 Grapnel boat anchors are the most simple and inexpensive solution for securing a small, inland watercraft. Their prongs can hook to nearly any jagged surface below the water, which makes them a great choice for fishing, camping, and recreational water sports. These anchors are also great for retrieving items that have gone overboard. Coming in a variety of sizes, you're sure to find one that's perfect for you. S k Gear - Elite Equipment For Outdoor Sea Adventures! Are you an enthusiast of kayaks, surfboards, paddleboards, or marine outdoor activities in general? Aren't you sick and tired of substandard quality gear and accessories that you can't rely on? Well, your search is over. S k Gear creates premium quality equipment for outdoor adventurers like you - exactly what you've been looking for! SandS k - A Fresh & Practical Idea Every Personal Watercraft Lover Would Love! SandS k is a portable sand anchor designed with kayaks, surfboards, SUPs and other light personal watercrafts in mind. 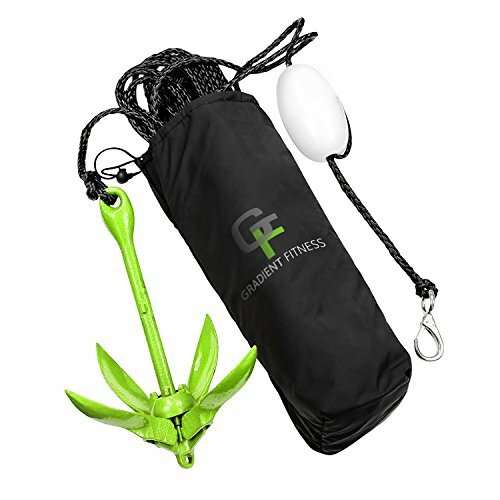 This smart sand anchor is a lightweight but strong 20L bag that, when filled with sand, can be heavy enough to act as an anchor for your kayak or paddleboard. SandS k is made of heavy duty 500D PVC with welded seams for increased strength, and features UTX clips, d-rings, and a handy bottom strap for quick and easy emptying. To tie and tow your craft, we've also included a 12' (4m) braided floating nylon rope, two 316 stainless steel clips and a buoy. What's more, every part of the SandS k bundle is made from high visibility yellow and green colors to maximize utility and make sure that they're always quickly and easily detected! At S k Gear, we make a point of designing our products from scratch ourselves, and using nothing but the best quality materials and state of the art production processes. That's why our SandS k sand anchor bags are designed to double as dry bags; in a pinch, you can easily use them to keep your clothes, phones, cameras, gadgets and personal effects dry! So, What Are You Still Waiting For? Just Click 'Add To Cart'! MULTI PURPOSE: SandS k is a smartly designed sand anchor for use with personal watercraft, kayaks, rafts, floats and paddle boards. It can also be used as a 20L waterproof dry bag, keeping your clothes, devices and personal effects safe and dry! HEAVY DUTY: SandS k is constructed from heavy duty 500D PVC with welded seams, UTX clips, d-rings and a handy bottom strap for quick and easy emptying. 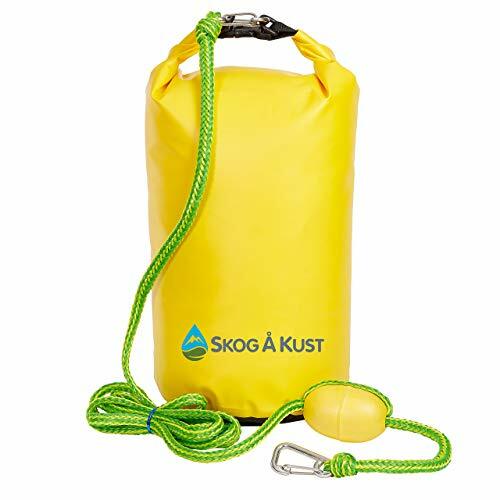 ROPE & BUOY INCLUDED: SandS k comes packaged with a 12' long braided floating rope with two rustproof 316 stainless steel clips and a buoy. Suitable for fresh or saltwater use. HIGH VISIBILITY: SandS k utilizes custom high visibility yellow and green colors. This allows it to stand out and be easily visible and accessible, even at night! LOVE IT OR YOUR MONEY BACK: At Skog Kust, we want to equip you with everything you need to live life to the fullest! That's why all of our products are backed by a satisfaction guarantee, as well as our lifetime warranty for manufacturing defects. STAY ANCHORED - Our folding anchor system is designed to keep your watercraft from drifting. It's been tested by our team extensively on rocky, muddy, silty, and sandy bottom environments. The 4 fluke folding technology effectively grabs the bottom, and allows for easy release when pulling the anchor back into your personal watercraft. Spend more time enjoying being on the water, instead of fighting an ineffective anchor. 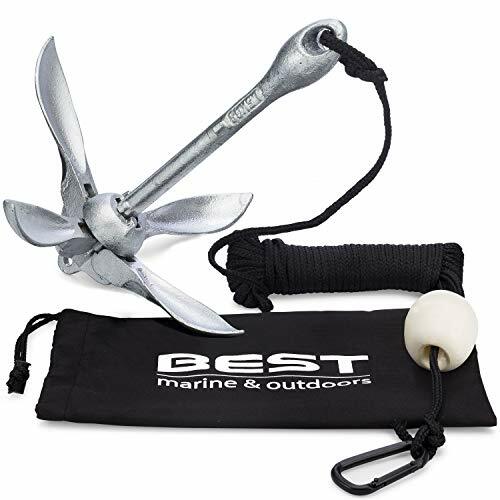 DURABLE - Our steel folding anchor, 40 ft marine grade rope, buoy, and stainless steel snap hook are built and tested to withstand all conditions. Whether you're in a lake, canal, river, or ocean, our folding anchor will withstand all elements. We want this anchor to be the last one you'll ever have to own. We've even gone the extra mile to reinforce it with a red painted coating to prevent rusting, and it is even backed with a money back guarantee. COMPACT SIZE - Space is valuable on a kayak, small boat, inflatable, jet ski, canoe, float, or SUP. We've designed this anchor specifically for small, personal watercraft. It measures 12 in by 3.5 in. This leaves plenty of space for fishing gear and other accessories. It's also light weight to prevent any additional drag on your personal watercraft. STORAGE + DRY BAG - We've included a padded nylon storage bag that stores perfectly in your personal watercraft and is designed specifically for the folding anchor. Additionally, we've also included a FREE 5 Liter dry bag that you can use to store the anchor or other items you want to keep dry. The 5 Liter dry bag is made of durable, tough PVC material, and includes a convenient shoulder strap. MONEY BACK GUARANTEE - We absolutely stand by our products. If at any time you're not satisfied with your folding anchor system, go ahead and send it back. The first anchor trolley designed specifically for the job, the YakAttack LeverLoc Anchor Trolley features a LeverLoc line clamp, which locks your trolley line in place with a simple "flip of a switch" motion. Keeping the trolley lines in line is the PadHook, a simple but clever design that combines the functionality of both a pad-eye and a hook, keeping even the tightest trolley lines in place on the side of the kayak, not over your gunwhale. When not in use, the easy-knot trolley ring snaps into the base of the LeverLoc, quietly secured until deployed. Includes 35' of USA made 550 paracord with a highly reflective tracer. Features Harken Pulleys for super smooth operation. PWC Sand Anchor & Buoy - A sand anchor is ideal for anchoring PWCs in shallow water to keep the impeller off the beach. 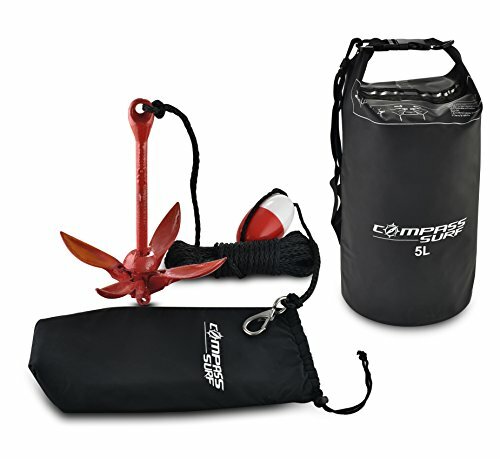 Fill this super durable tri-laminate anchor bag with up to 35 pounds of rocks or sand. A buoy marks the anchor s location. Tie-ups are easy with the 6-foot long rope and the oversized finish-friendly acetyl snap hook. A = 24" B = 12" C = 18-1/4"